My winter held a unique tour of the spiritual traditions. 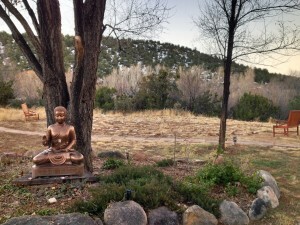 I attended a neuroscience workshop at the Upaya Zen Center before working with Presbyterian ministers/trainers, then on to a workshop on indigenous wisdom with Patrick O’Neill. Last, as you read earlier, I supported a conference of primarily Muslim participants in Morocco. That’s my version of wonderful season! The minister trainers all engaged in communal prayer multiple times a day ending in a short, but profound service. Indigenous practices include the use of morning prayers and drumming, and of course, every day in the Arab world was framed with 5 calls to prayer over loud speakers beginning before sunrise to sunset. Study the world’s religions and you must study ritual. Rituals very practically call us to stop a busy mind and be in the moment. Cultural anthropologist Angeles Arrien described this cross-cultural goal as “Show up, choose to be present.” We don’t want to squander our lives and ritual is our crutch to make this a habit. Whether it is breath, a service or bowing with our head to the ground, the religious traditions figured out that a daily requirement of committed ritual can help us get back to the here and now. When we understand how precious each moment is, we can treat each breath, each moment, as a newborn baby. I had a long layover in Minneapolis as I returned from Morocco, which gave me 5 hours reconnecting to my childhood haunts. A ritual walk around the lake near my growing up house with a friend of 39 years called me to show up where I now stood and notice from where I had come. Some rituals may be prescribed by our cultural traditions, but we can develop others to support our wellbeing. For some it might be saying “I love you” while looking in the eyes of a child or spouse every night before sleeping. For others it might be appreciating the sunrise and sunset each day. What might bring you back to the present? 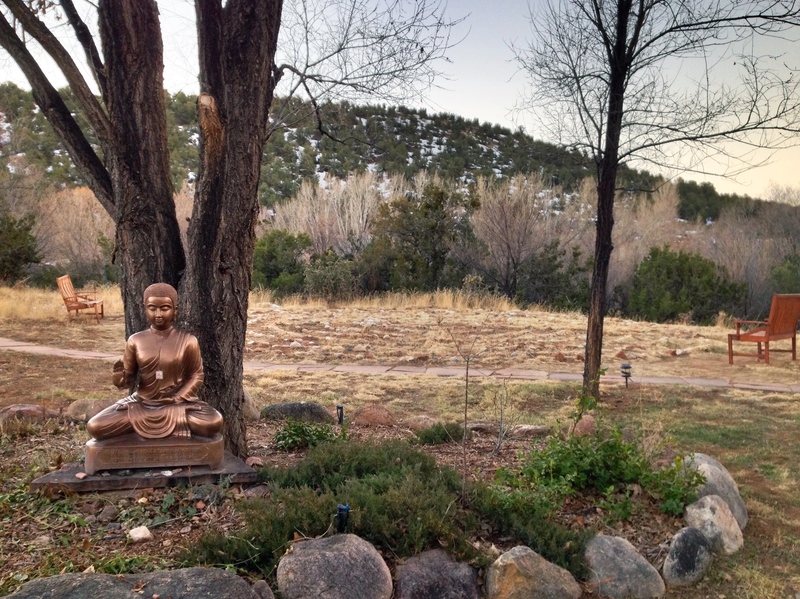 Where might you commit to making a simple ritual your daily centering habit? Life is short, let’s play this well. 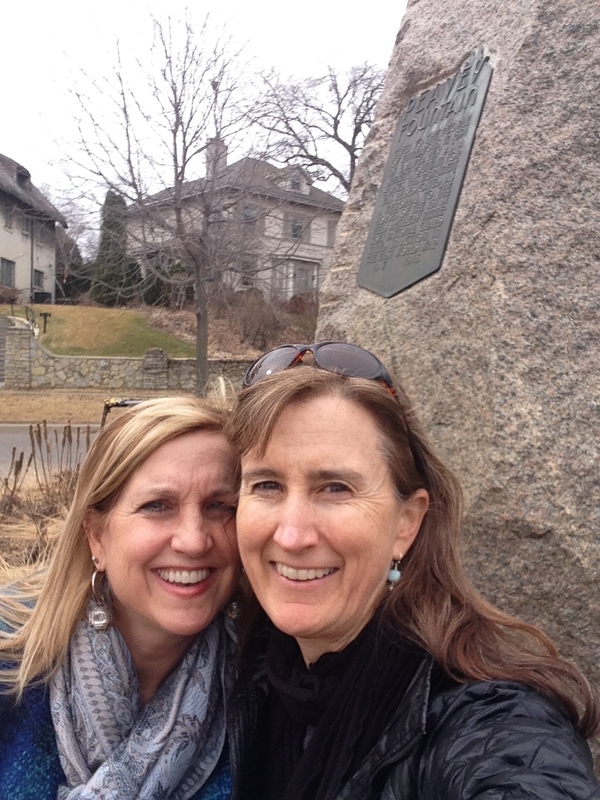 This entry was posted in Leadership Development, Play, Uncategorized and tagged Buddhism, Islam, ritual, spiritual practices on April 3, 2015 by Deidre Combs. I am noticing that other consultants I respect, like Steve Roberts above, have been often writing this year about the need to slow down, get quiet and listen. They speak to my soul. A few weeks ago, I was working in Puerto Rico and took a bathroom break to find this. 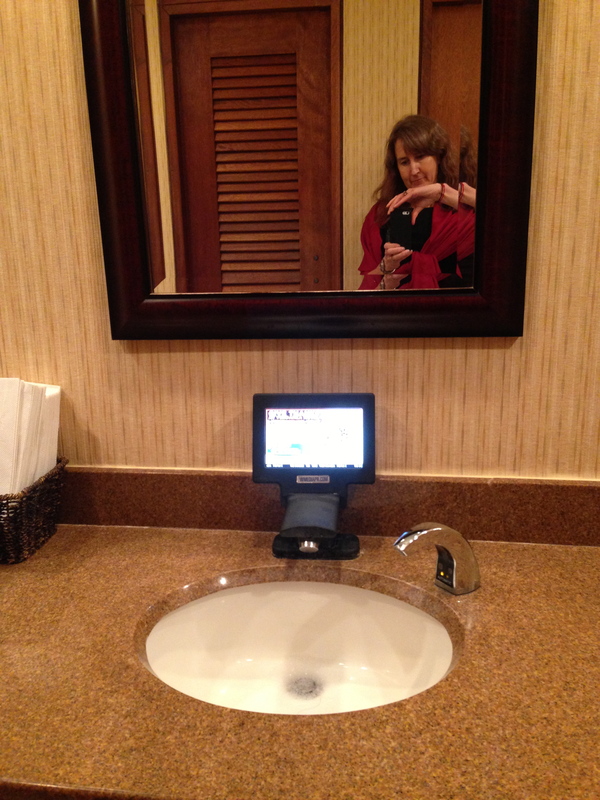 Really, we need screens in the bathroom now too? When I am mediating or facilitating tough disputes, bathroom breaks provide needed moments of quiet and space to re-center. Last week, I refueled the car to find that the local station had added TVs above every gas pump. 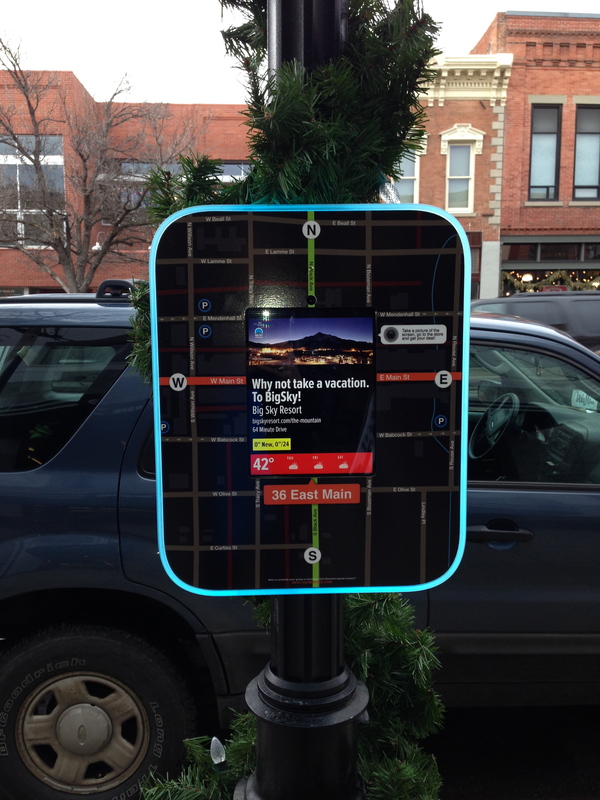 Then, walking down Main Street in Bozeman, and I found that they have installed screens on lampposts. Oh my. I’m sure you can add three more crazy locations you have found screens installed in your daily life, but this is rough news for this gal. Ever since I was little when a television is on, my eyes are glued to the screen. If you want me to complete a sentence, don’t take me to a sports bar, or even a sushi bar if they happen to need to play Japan-amation. My students giggle at how easily I am distracted by shiny objects in whatever form; that dancing screen light seduces me away in seconds. So, how can we call for silence and time without stimulus when the screens have become an invasive species? I don’t have an answer to share. This is probably just an end-of-year a plea for no screen zones. How might I advocate for places where I can keep my observation skills turned on without having them co-oped by CNN, ESPN or Fox? How might we demand that some parts of our world are preserved for re-centering, quiet and clarity? In meantime, I am trying to find humor in all the strange places that screens are sneaking in like these naughty pets who are so proud of what they have accomplished! I will also admit that seeing Thor leap around on that screen while washing my hands wasn’t the worst part of my day. May you find joy, humor and a bit of quiet during this holiday season. This entry was posted in Life Challenges, Play, Tough times, Uncategorized and tagged Bozeman, centering, conflict, quiet on December 21, 2013 by Deidre Combs. When researching Thriving Through Tough Times, I learned that to fully recover from difficult circumstances we are counseled to give. Giving creates meaning out of rough situations, moves us out of ourselves and generally makes us feel better. Andy Mackie’s example as you’ll watch below, adds a whole new level of promise to the “give back to come back” maxim. After nine heart operations and drugs that sickened him, Mackie decided to use the money he had been spending on prescriptions to buy harmonicas for school age children. With little time to live, according to the physicians, Mackie wanted to finish well by doing what he loved. But, Mackie didn’t finish his time on earth as quickly as predicted, and month after month he bought more harmonicas and taught kids how to play. Eleven years and some 16000 harmonicas later, Andy Mackie left behind a strong musical and ethical legacy when he passed away at 73. This entry was posted in creativity, Leadership Development, Life Challenges, Play, Uncategorized and tagged art, death and dying, leadership, music on September 5, 2013 by Deidre Combs. As a continuing theme of this blog, I want to share the work of two artists who bring both beauty from and insight about our oceans’ treasures. Richard and Judy Lang have collected plastic debris since 1999 from 1000 yards of Kehoe Beach in Point Reyes National Seashore and create museum-worthy art. This entry was posted in Conflict transformation, creativity, Leadership Development, Play and tagged art, environment, leadership, mindfulness, playing well on November 6, 2011 by Deidre Combs. 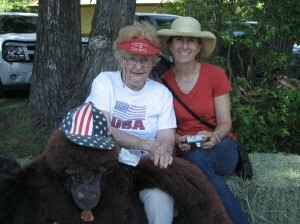 My mother-in-law Jinny Combs taught me many things. After running a guest ranch in southwestern Montana for fifty years, Jinny could have easily written a long book on leadership, but instead she penned three cookbooks and a collection of funny stories about life at the Diamond J.
Jinny taught that you could use writing to foster flexibility. When we would lose a pet or a person, my mother-in-law would write a poem. Sometimes a haiku composed at 4 am fit the bill and in other cases, a prose poem was right. Really anytime life surprised her, Jinny took pen to paper and reframed the situation into one that had value and, most often, a whole lot of humor. These poems were never just for her. Once the story was captured in verse, it was typed, copied and sent out to a large distribution list of friends and family. An envelope with Jinny’s distinctive writing was a harbinger of news that although it may contains some sadness would always have us giggling. Each piece would also end with an “ole!” Since my in laws spent their winters in Mexico that felt fitting, but this now feels like a constant call to get back on your feet and cheer that you are still here. Jinny was never one for focusing on loss or grieving, at least around us. There were guests to meet in the summer, or to correspond with off season, and more fun to be found. Jinny read whatever I wrote loyally, including this blog. The videos were her favorite and, before she got sick last spring, they always engendered calls and emails. It should be no surprise to me that I have been putting off composing a post after losing her last August. I would like to chalk it up to too much work, but if I am honest, I have been avoiding the pain of writing without her reading. This entry was posted in Conflict Skills, Conflict transformation, creativity, Leadership Development, Life Challenges, Play, Tough times and tagged creativity, death and dying, leadership traits, loss, writing on October 28, 2011 by Deidre Combs. Bruce. on Who are you?